The difference between a game like what we get to observe when the Royals and non-Cleveland American League Central opponents get together and when Kansas City tries (and usually fails) to go toe-to-toe with the Tribe is that there is some actual fun to be had. Oh, I’ll grant you that Cleveland’s run as (ironically?) the Golden State Warriors of the Central means that the target is on their back and that they’ll always get the best shot their outgunned opponent can give them, and it’s cute that occasionally one of these teams full of goobers will beat the Great and Powerful Indians. But the result is largely token, and only a simpleton would believe otherwise. Now, Minnesota and Kansas City? That’s even footing. 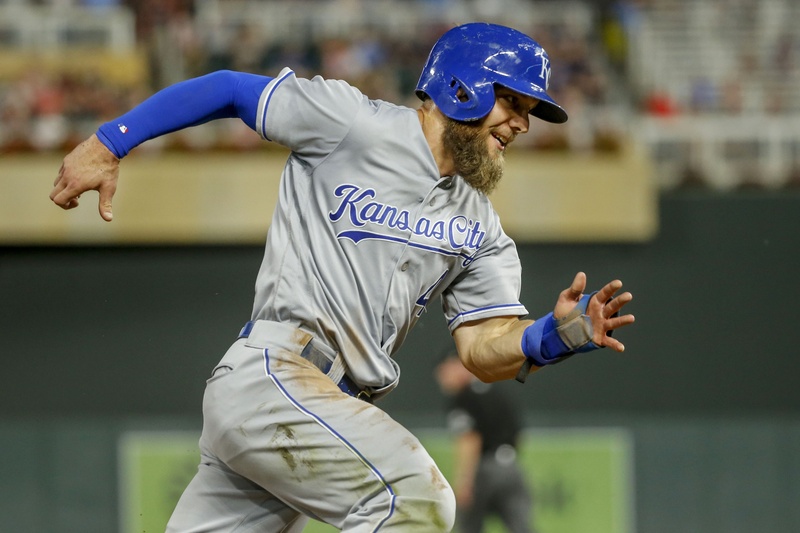 And Saturday’s show was another quality performance by the Royals, who won their first series since late May with a 4-2 decision against the Twins. Both teams slapped up runs in the first inning. Twins leadoff hitter Joe Mauer doubled to get the game started and scored on an Eddie Rosario single, while a Jorge Bonifacio walk begat a Salvador Perez homer in the Royals half. Perez is hitting .303 over the last eight games, with three homers and 11 RBI. He’s heating up. The 2018 All-Star experience may not have been in vain. The Royals added a run in the third, but oh what might have been. Alcides Escobar led off with a walk, then the lineup turned over with pop outs from Whit Merrifield and Bonifacio. Mike Moustakas and Perez then drew two-out walks to bring up Lucas Duda, who singled in a run and could be YOURS if the price is right! With the bags still full, Hunter Dozier worked the count full before grounding out to Mauer at first to end the inning. With 18 days between appearances, Ned Yost used caution with young Master Junis and removed him after four innings and 77 pitches. Speaking of terrible pitch economy, Lance Lynn needed 118 pitches to get through five innings. During the broadcast, Whitey Herzog rolled through to spout some old-man “the game was better in my day” nonsense, but he may have been onto something about pitchers throwing too many pitches. Brian Flynn replaced Junis and pitched three scoreless innings. Somehow, I seem to have missed that Brian Flynn turned into one of the more passable options in Ned Yost’s bullpen, but he clued me in tonight with three innings, four strikeouts and one lone hit allowed. Jason Adam—who surrendered a single to Rosario, balked him to second and then gave up a single to Eduardo Escobar to plate him—not so much, but Ned Yost removed him before too much damage could be done and Tim Hill got Jorge Polanco to bounce into the 4-6-3 double play to end the inning. A one-run lead with [gestures] THIS bullpen is not a source of personal comfort for me or anyone else that watches this team on the regular. Which is why, fortunately, they were able to tack on another in the eighth. Alex Gordon and Rosell Herrera led off the frame with walks and moved up thanks to an Escobar sacrifice. Merrifield punched a single through the drawn-in infield to score Gordon—given that Bonifacio’s bouncer to third would nail Herrera at the plate three pitches later, he probably should’ve been waived home as well, especially since the throw from Rosario in left was a good 30 feet up the first base line. Either way, it made it a 4-2 game and Wily Peralta got a chance to redeem himself after last night’s fiasco. Max Kepler ground out, Robbie Grossman ground out, Jake Cave strikeout = redemption. The Bright Spot: Flynn, who got a Salvy Splash for his troubles. Also, shouts to Jorge Bonifacio—three walks from the two-spot. The Nadir: Hunter Dozier was 0-for-4 on the night, is 1-for-8 on the series and 4-for-32 since July 6. He’s hitting .206, which is not what you’d prefer out of your DH. The Next Step: Brad Keller has been solid since moving into the rotation and now he has a chance to secure a sweep (yes, teams are allowed to sweep other teams) when he toes the rubber against Jake Odorizzi and the Twins at 1:15 p.m. (CT), Sunday. RECAP: A win! That was fun!